The CGOA will be pairing conference "Newbies" with experienced conference goers as "Buddys". Terry K. will be coordinating the placement of buddies with newbies and we will be planning some events to do together to welcome the new attendees. If you remember your first time at the conference, you will appreciate how nice it will be for the new folks to come, knowing someone will be there to give them a hand. This does not have to be a huge time commitment, and once you are assigned, you can work together with your buddy and decide how to proceed. Terry will be organizing a few events to attend together that will break the ice for the newcomers. You can also contact the CGOA management office for more information. Stitch N’ Pitch is making an attempt to set the Guinness Book of World Records for Most People Crocheting Simultaneously at Mets Citi Field on Saturday, June 5th at the Mets 4th Annual Stitch N’ Pitch event. Come and help us make history! Click here for the official event flyer and FAQ. • Are encouraged to arrive early - gates open at 1:30PM. • Check in outside Section 531 to receive your complimentary crochet hook and yarn. • Be seated no later than 2:00PM in Section 531 with crochet hook and yarn. • Crochet for at least 15 minutes non-stop in order to set the record! Chain Link 2010: Online Registration Now Open! We hope you will join us for a wonderful crochet conference experience in Manchester, New Hampshire in August. Online registration is now open! Please click the following links for information on classes, daily activities, and registration. We hope to see you in Manchester! SELLING OUT: Several classes have already sold out! Register soon to be sure you get the classes you really want to take! For hotel and travel information, go to the Knit & Crochet Show Travel page. 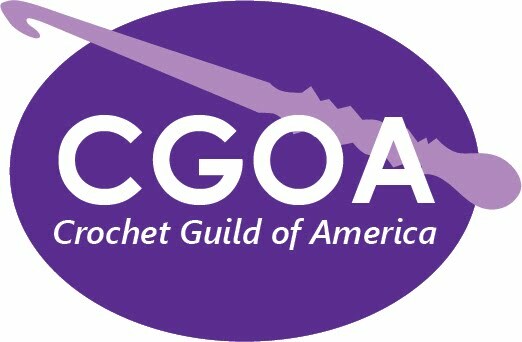 Get information on CGOA's 2010 Commemorative Crochet Hook.